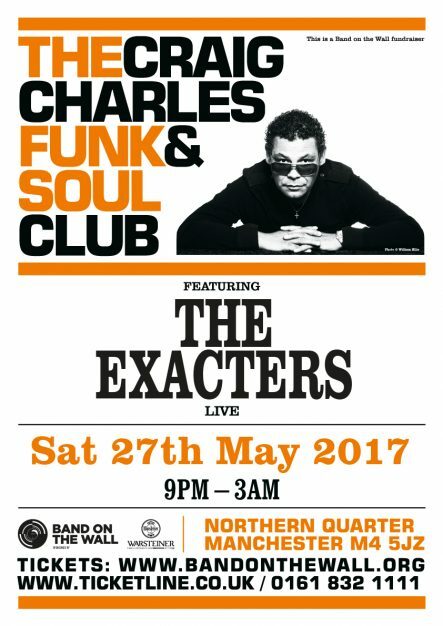 We’re taking the flavoursome funk far into the night as the Craig Charles Funk & Soul Club returns to Band on the Wall with acclaimed DJ, actor, presenter and funkster about town Craig Charles manning the decks, plus special guests The Exacters live! The Exacters are from Manchester, UK, and they play heavy funk. Their debut single, Ain’t Gonna Lie, features guest vocalist Roxie Ray (Dojo Cuts, Lack of Afro) and has been filing funky dancefloors since its release on Our Label Records in 2016. With a four-piece rhythm section, four-piece horn section and the powerful vocals of Yemi Bolatiwa in their live show, this is a performance not to be missed. •	There will be no entry to non-ticket holders. If you wish to attend, you must obtain a valid ticket in advance. There will be no ‘on the door’ sales. •	All bags will be searched before entry and all bags must be stored in the cloakroom. There will be no cloakroom charge for bags. •	All customers will be searched before entry. A long term revised security policy will be announced in due course.